MDR is back from his 12 day whistle stop tour of USA & Nova Scotia (via Japan) and was up bright and early this morning, showing very little sign of jet lag, so off he went to Rustys. Yamagishi eggs are always on the list and MDR loves the Super Jumbo eggs (around $5.00 per dozen), the Japanese guy on the Yamagishi stand even greeted MDR with "Gidday Mate" today, his English is improving no end. The super jumbos often have double yolks (luckily neither MDR nor MB have problems with cholesterol) which is always a delight when one cracks open the egg to find it's a double yolker, for some reason it feels lucky. One egg in particular in today's purchase weighed in at 120grams. MB had picked up some Extra Large Yamagishi eggs (around $4.50 a dozen) during the week so compared one with today's, the XL was about 70grams. 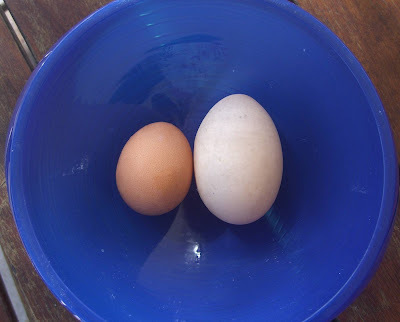 As you can see in the picture, the Super Jumbo dwarfs the XL egg. Those Yamagishi chooks must be huge! You sure they're not emus?